Sneferu (also read Snefru or Snofru), well known under his Hellenized name Soris (by Manetho), was the founder of the 4th dynasty during the Old Kingdom. Estimates of his reign vary, with for instance The Oxford History of Ancient Egypt suggesting a reign from around 2613 BC to 2589 BC, a reign of 24 years, while Rolf Krauss suggests a 30-year reign, and Stadelmann a 48-year reign. He built at least three pyramids that survive to this day and introduced major innovations in the design and construction of pyramids in Ancient Egypt. Detail of a relief showing Sneferu wearing the white robe of the Sed-festival, from his funerary temple of Dahshur and now on display at the Egyptian Museum. 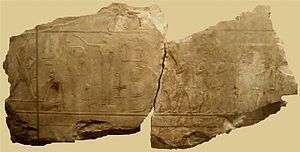 The 24 year Turin Canon figure for Sneferu's reign is considered today to be an underestimate since this king's highest known date is an inscription discovered at the Red Pyramid of Dahshur and mentioning Sneferu's 24th cattle count, corresponding to at least 24 full years. Snefru, however, was known to have a minimum of at least three years after the cattle count dates: his years after the 10th, the 13th and the 18th count are attested at his Meidum pyramid. This would mean that Sneferu ruled Egypt a minimum of 27 full years. Sneferu was the first king of the fourth dynasty of Ancient Egypt, who according to Manetho reigned for 24 years (2613-2589 BC). Manetho was an Egyptian priest, living in the third century BC, who categorized the pharaohs of dynastic Egypt into 31 dynasties. Manetho’s schematic has its flaws; nevertheless, modern scholars conventionally follow his method of grouping. The Papyrus Prisse, a Middle Kingdom source, supports the fact that King Huni was indeed Sneferu’s predecessor. It states that "the majesty of the king of Upper and Lower Egypt, Huni, came to the landing place (i.e., died), and the majesty of the king of Upper and Lower Egypt, Sneferu, was raised up as a beneficent king in this entire land..." Aside from Sneferu’s succession, we learn from this text that later generations considered him to be a "beneficent" ruler. This idea may stem from the etymology of the king’s name, for it can be interpreted as the infinitive "to make beautiful." 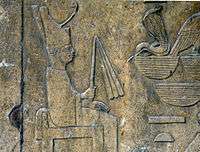 It is uncertain whether Huni was Sneferu’s father; however, the Cairo Annals Stone denotes that his mother may have been a woman named Meresankh. Hetepheres I was Sneferu’s main wife and the mother of Khufu, the builder of the Great Pyramid on the Giza Plateau. Khufu - son of Sneferu and Hetepheres I, successor to Sneferu. Ankhhaf - King’s Son of his Body, King’s vizier (under his nephew Khafre). Buried in G 7510. A famous bust of Ankhhaf is now in the Boston Museum of Fine Arts. Ankhhaf was married to the King’s Daughter Hetepheres. Kanefer - King’s eldest son and Son of his Body. Buried in tomb 28 in Dashur. Second Vizier of Sneferu, who continued to serve under Khufu. Nefermaat I - eldest son of Sneferu and husband of Itet. Titles included: Priest of Bastet, Hereditary Prince, Guardian of Nekhen, great one of the five at the house of Thoth. First Vizier of Sneferu. Rahotep - King’s Son of his Body, High Priest of Re in Heliopolis. Buried in Meidum with his wife Nofret. Owner of the famous statues now in the Cairo Museum. Iynefer I. Buried in Dashur. Hetepheres A, married Ankhhaf. She was named after her mother, Queen Hetepheres. Nefertkau I - King’s Daughter of his Body, eldest daughter of Sneferu and his third wife. Buried in mastaba G 7050 at Giza. Her tomb dates to the time of Khafra. In the tomb Sneferu is mentioned as well as Nefertkau's son Nefermaat II and her grandson Sneferukhaf. Nefertnesu - King’s daughter, God’s Daughter. Had a son named Kaemqed. Meritites I, Great of Sceptre and King’s Wife, married to her brother Khufu. Henutsen - King's daughter, married to Khufu. The most well known monuments from Sneferu’s reign are the three pyramids he is considered to have built in Dahshur: the Bent Pyramid, the Red Pyramid and Meidum (the Meidum pyramid). Under Sneferu, there was a major evolution in monumental pyramid structures, which would lead to Khufu’s Great Pyramid, which would be seen as the pinnacle of the Egyptian Old Kingdom’s majesty and splendour, and as one of the Seven Wonders of the Ancient World. 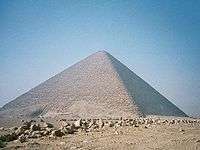 The immense stone structure serves as physical testimony to the transition from the stepped pyramid structure to that of a "true" pyramid structure. Archaeological investigations of the pyramid show that it was first conceived as a seven-stepped structure, built in a similar manner to the Djoser complex at Saqqara. Modifications later were made to add another platform, and at an even later stage limestone facing was added to create the smooth, angled finish characteristic of a "true" pyramid. Complete with a descending northern passage, two underground chambers, and a burial vault, the pyramid mainly follows the conventions of previous tombs in most aspects other than one: instead of being situated underneath the colossal structure, the burial chamber is built directly within the main body albeit very near ground level. Sneferu's Bent Pyramid at Dahshur. The satellite pyramid complementing Sneferu’s Bent Pyramid introduces more change in the architecture of the time, when the passageway is built ascending westward (as opposed to the conventionally descending northward direction of the passages of previously build pyramids) towards the burial chambers. With the increase of innovation in Sneferu's building projects, one expects that his last pyramid, the Red Pyramid, will show the greatest complexity and change in architecture yet. Upon first glance, one may be disappointed seeing that the construction of the Red Pyramid seemingly is simpler than its predecessor. Lepre points out that some of the internal innovations that the previous pyramids boast seem to be missing in the king’s last monument. Although the chambers and burial vaults are all present in the monument’s main body, no ascending passageway has been excavated, nor is there evidence of a western entrance or diagonal portcullis. Although the absence of these features have dissuaded many archaeologists from further studying the Red Pyramid, Lepre is convinced that there are secret chambers waiting to be uncovered within the stone superstructure. Considering that the remains of King Sneferu have not yet been found, it still may be possible that his sarcophagus and mummy lie hidden in his mysterious last structure. Lepre claims: "the Red pyramid remains one of the chief pyramids that may possibly contain secret chambers, not the least of which may be the true burial chamber of King Sneferu himself." Whether or not this conjecture is true is left to modern archaeologists to determine. Sneferu’s architectural innovations served as a catalyst for later pyramid builders to build on. The first king of the fourth dynasty set a challenging precedent for his successors to match, and only Khufu’s Great Pyramid can rival Sneferu’s accomplishments. As time progressed and ideology changed in Ancient Egypt, the monuments of the kings decreased greatly in size. As the Pyramid of Menkaure is only a fraction of the size of the previous pyramids, the focus of Egyptian ideology might have shifted from the worship of the king to the direct worship of the sun god, Ra. According to this inscription, Sneferu was able to capture large numbers of people from other nations, make them his prisoners and then add them into his labour force. During his raids into Nubia and Libya, he also captured cattle for the sustenance of his massive labour force. Such incursions must have been incredibly devastating to the populations of the raided countries, and it is suggested that the campaigns into Nubia may have contributed to the dissemination of the Nubian A-Group culture of that region. Sneferu's military efforts in Libya led to the capture of 11,000 prisoners and 13,100 head of cattle. Aside from the extensive import of cedar (most likely from Lebanon) described above, there is evidence of activity in the turquoise mines on the Sinai Peninsula. There would also have been large-scale quarrying projects to provide Sneferu with the stone he needed for his pyramids. Sneferu's ancient cedar wood ship Praise of the Two Lands is the first recording of a ship being referred to by name. ↑ Krauss, R. (1996). "The length of Sneferu's reign and how long it took to build the 'Red Pyramid'". Journal of Egyptian Archaeology. 82: 43–50. JSTOR 3822113. ↑ Rainer Stadelmann: Beiträge zur Geschichte des Alten Reiches: Die Länge der Regierung des Snofru. In: Mitteilungen des Deutschen Archäologischen Institutes Kairo (MDAIK), Vol. 43. von Zabern, Mainz 1987, ISSN 0342-1279, p. 229–240. Wikimedia Commons has media related to Seneferu. Wikimedia Commons has media related to Meidum Pyramid. Wikimedia Commons has media related to Red Pyramid.